Back in late-February, Samsung had announced an addition to its Galaxy range of handsets with a smartphone which had an integrated projector and named it Beam. At that time we knew that the device will be arriving in the next few months but we never had an exact date. 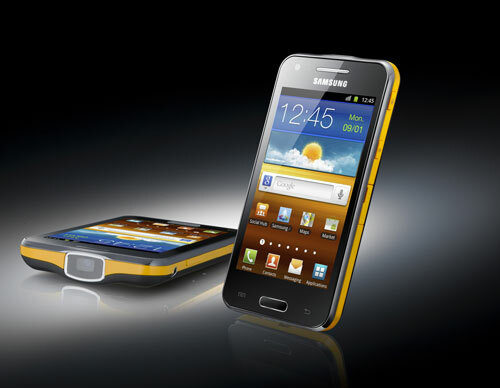 But it now seems that the Korean giant has decided to launch the Samsung Galaxy Beam first in India and make it available from April. Galaxy Beam will go on to be first smartphone with an in-built projector and runs on Android Gingerbread 2.3 OS. Until now all the projector based devices that were launched and available in India has run on Java. So this is something like a best upgrade. Even with a projector on its top, the Galaxy Beam measures just 12.5 mm thick and still goes on to maintain an ergonomic design. Has a 4 inch TFT display with 1 GHz of processor. There is a 5 MP shooter at the rear and a front facing 1.3 MP camera. It has 8 GB of internal memory which can be expanded to 32 GB using SD card and a 2000 mAh battery. There is no information on the price tag the Galaxy Beam will arrive with but rumours have it that it should range anything between Rs. 26,000 – Rs. 31,000. We’ll leave the speculations aside and wait until a few more for the official launch.